This article is written to explain how to use this integration - for more information on setting up your integration, read this article. First, create a Marketo content type in your Content Types and Workflows Settings menu. The Display Name and Field Name can be anything, but make sure you select Marketo Email as your body type. Add your Marketo Email as your Primary Destination for this content type. Click on the "Add Marketo Email" button. A pop-up will appear that will allow you to enter search parameters for the email you want to add. First, choose whether you want to search by email name or by program. Type in your search keywords - this will open up the two drop down menus below it. 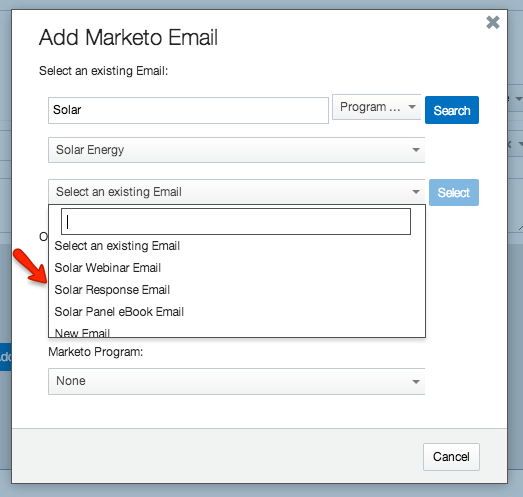 Once you click "select," Kapost will pull in the selected email from Marketo directly into your instance. Approve in Marketo: Selecting "Approve in Marketo" from the Email drop down will approve the email that is housed in Marketo, thus enabling you to move Marketo emails out of the draft phase from within your Kapost instance. Edit in Marketo: This function will open up your Marketo instance so that you can edit it in Marketo. 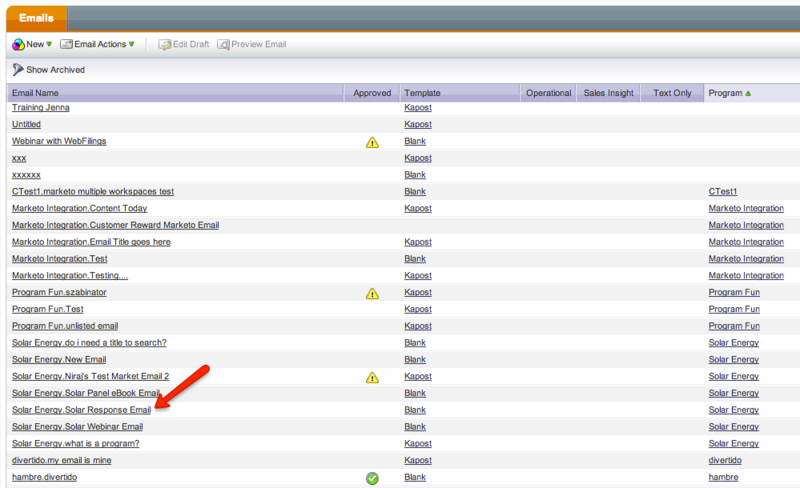 You cannot edit a Marketo email within Kapost, but this function gives you easy access. Note: Best practice for editing Marketo emails in Kapost is for one team member to build the email via custom fields in Kapost, have another team member use those fields to build the email in Marketo, and then pull the finished Marketo email back into Kapost for approval. Note: If you are using Dynamic Content, read this. If you have any questions or feedback about editing Marketo emails in Kapost, feel free to email us at support@kapost.com.